There are some cases in which profiles are very appropriate for brands, such as personal or celebrity brands. My profile, for example, is much more useful for me than a page would be, since it chronicles my personal life and allows for deeper levels of engagement with my friends. Also, profiles provide the unique ability to invite users to events, organize them into convenient lists, tag them in posts and photos, and interact on a far deeper level by commenting on their posts, links, walls, etc. However, we must be mindful of the fact that many consumers still resent the intrusion of marketers into social media. Many of them find it bothersome enough that we have paid ads and pages. The fact that we’d intrude into their lives with profiles of our own may offend some. Also, there’s an issue of scale when choosing between pages and profiles. It’s not Facebook’s intent that profiles be used for marketing businesses; therefore, they reserve the right to prevent you from making additional friend requests, which can severely limit the potential reach of your Facebook marketing efforts. So while Facebook profiles have some engagement features that may be more useful than pages, you must balance the advantages of pages and decide which is better for your company or brand. Are you a personal brand, or do you want a deeper level of engagement with a smaller number of people? If so, consider a profile! I remember when Facebook first opened themselves up for third-party application development. For a while, I checked every day to see what was new and what was the latest and greatest. Now, with countless apps being added every day, it’s almost impossible to keep up with them all. Facebook apps provide a fascinating opportunity for marketers. If you can create an application that is useful to your consumers, whether they’re already your customers or not, you can create your own phenomenon to help put your brand in front of a massive audience of potential customers. If you can create a tool, game, or other system that builds value relevant to your consumers, you can do amazing things. Can you think of any kind of neat app or game that would make using your product or service easier? Here’s a neat trick on how to use Facebook PPC for B2B sales: If you’re targeting a specific company, find out what city its corporate headquarters is located in. Then target fans of its page who live in the same city as the company’s HQ. Odds are, most or many of their employees (including senior management) are fans of the company page. This gives you a unique opportunity to put your ad right in front of their faces, and even create custom landing pages to capture their e-mails or phone numbers for follow-up campaigns. What about you? If you know of other ways to use Facebook for marketing, or if you have any questions on what I’ve written here, feel free to comment below! In all aspects of business, it is vital to utilize various tools to evaluate performance. One such device is the Johari Window. This tool is especially important for those of you in the marketing profession. 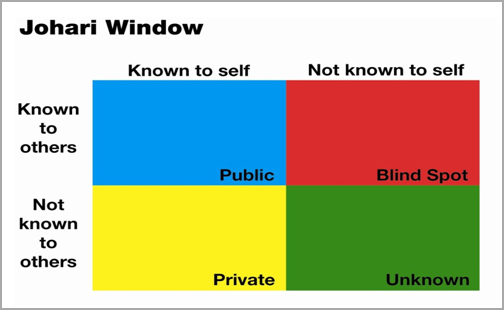 The Johari Window is broken into four distinct quadrants. Let’s start with the upper left (blue) quadrant. This quadrant deals with things that are “public” in nature, meaning they are known both to you and others. It may seem that everything in the world of online information falls into this quadrant, but this is not true. For example, if you publicly display information that is accessible to anyone—on Facebook, Twitter, LinkedIn, etc.—then you fall into this category. The lower left (yellow) quadrant applies to things that are “private” to you (known to self) and are not known by others. This makes for quite a challenge in the social media environment, as it is hard to keep things private in a world that wants to make everything public. In social media, posted/written information often has a life of its own. So many times, private information might be accidentally posted in a place where a person thinks it is safe and private but where others actually have access to it. For example, many people go on job interviews where the interviewer already knows a lot about them beyond their resume, just by conducting a search for that person’s name on Facebook or Google with just a few keystrokes. So we must purposefully control what we do and do not want people to know. The lower right (green) quadrant is referrerd to as “unknown.” These are things we all speculate about and quite frankly are unsure of the answers. For example, will Twitter be around in three years? Will Google keep growing? Will the economy turn around in 2011? Will the buying patterns of Generation Y remain the same in five years? You get the idea. So this area of the window represents those things that neither you nor the people you are targeting are completely sure of. This quadrant is an important one to consider as you develop your overall marketing plans and what role social media will play now and in the years ahead. The upper right (red) quadrant is called the “blind spot.” This refers to something that is known to/seen by others but not known to/seen by yourself. This provides a huge growth opportunity for all marketers. If we are not aware of our blind spot, then we are truly operating “blind.” This means we are not aware of what we are missing—and yet, others around us are quite aware of it. This is a huge no-no for social media marketing. For instance, let’s say your company (in the opinion of all stakeholders beyond you) feels you are overdoing or over promoting your every success through the many social media tools available. So colleagues, employees, clients, vendors, and others see your campaigns/efforts as overdone and borderline obnoxious. But what if you think (your blind spot) you are not doing enough promotion and need to increase your social media marketing efforts? The key is to learn what your blind spot is, so you can address it. A great way to accomplish that is to get candid feedback from a variety of different people who will tell you the truth and not just what you want to hear. The overall goal here is for you to use the Johari Window as another way to examine what you are doing, why you are doing it, what you know, what you don’t know, and why you do what you do. Doing so will enable you to be purposeful in all your marketing efforts. Rememember… the tools of social media are here to stay, and they will become even greater in the years ahead. With the whole field of social media marketing coming together over the past few years, there has been a feeling of constant change. Twitter has gone more mainstream in the past 18 months, Google Buzz has jumped into the fray, Facebook fan pages have gained momentum, and corporate blogging is getting the true attention it deserves. As a result, it will be important to quickly recognize what actions a company must take in this frantic environment so time and resources wasted are limited. The first focus, and perhaps the most important one, is avoiding what I call social media “tool mania.” This condition results from people getting caught up in the swirl of experts and gurus crying out for everyone to be using Twitter, Facebook, LinkedIn, blogs, and any other tool that is available in today’s social media marketing marketplace. The implication being if you are not using these tools, you are not an effective marketer. What has thus been created in this initial wave of social media marketing efforts is a focus on the tools to be used with little or no consideration for the business application of the tools. I tell people that while a screwdriver is a fantastic tool, you are not going to paint a house with one. The same basic theory applies to social media marketing. If a tool such as a Facebook fan page or a blog simply does not fit your business needs, then you may not need to have one. Social media heresy, I know, but more often than not, these ill-conceived efforts end up costing companies valuable time and resources with little or no return. So why the rush to apply these tools without the appropriate assessment of the business application? Well, people don’t want to seem like they are not current or cool. Since “everyone” has a Facebook fan page or Twitter presence, then I have to as well, right? First, the statistics don’t bear out the “everyone is doing it” theory. A Burson-Marstellar study published in February 2010 shows that 65 percent of the Fortune Global 100 had active accounts on Twitter, 54 percent had a Facebook fan page, 50 percent had a YouTube channel, and 33 percent had corporate blogs. While encouraging, these numbers really say little, because having a presence is no indication or guarantee of success. Just look at the graveyard of Facebook presences that haven’t been updated in months and blogs that have been left to rot on the vine. These do more damage than good, so were they really a smart use of resources? Not likely. So what are we to do? Well, it’s pretty basic. Research where your customers are, determine how your competition is engaged in social media, get the right resources in place, establish KPIs that are truly measurable, and then proceed with business acumen and solid business common sense. Be careful, though, because many of the social media “tool purveyors” don’t have the business skills and knowledge, due to lack of overall business experience. A general who takes his troops into battle with plenty of weapons but no battle plan would be labeled a fool. My question then becomes is there any difference in a social media marketer doing the same thing?